Soft disposable contact lenses are made of soft, flexible plastics that allow oxygen to pass through to the cornea. Soft contact lenses may be easier to adjust to and are more comfortable than hard, rigid gas permeable lenses. Newer soft lens materials include silicone-hydrogels to provide more oxygen to your eye while you wear your lenses. It is common to feel some slight irritation when wearing contact lenses for the first time. The eye gradually adjusts to this discomfort by decreasing its sensitivity over the course of around ten days. Because of this, it is best to gradually increase the time spent wearing contact lenses. Start with four hours per day and increase this by one hour per day. It is also sensible to aim for a day off after the first five days while you are acclimatising to contact lens use. 1. An inside-out lens – remove the lens and turn it the right way around. 2. Residual debris on the lens – remove the lens and clean thoroughly before putting it back in. Overwear of contact lenses can lead to irritation, infection or intolerance, whereas brand new contacts give your eyes a feeling of refreshment – just like putting on clean clothes. Replace your contact lenses as recommended by your optometrist to reduce the risk of discomfort. 1. Wash hands and dry them with a towel. 2. Place the contact lens on the tip of your index finger (which should be no wetter than your eye or the contact lens) and tuck your other fingers out of the way. 3. Look down, then gently pull your top eyelid upwards with the middle finger and ring finger of your free hand, be sure to grab right at the edge of the lid. 4. Look up, then gently pull down your bottom eyelid with your middle finger. 5. Whilst still looking up, place the contact lens on the lower white part of the eye. If you find this difficult, you can look straight ahead and place the contact lens on the iris (coloured part of your eye), with the bottom edge of the contact lens touching first. 6. Look downwards, then release your eyelids. 7. Gently massage the contact lens into place through the lids or blink a few times. 8. Once your lenses are in place, rinse their case with multi-purpose solution and leave it to air dry. You should replace the case every three months. 2. Look down, and pull your upper eyelid upwards as before. Then look up, and pull your bottom eyelid down with your middle finger. 3. Gently drag the contact lens off the iris with your index finger, and without removing your finger, pinch the contact lens off the eye with your thumb and index finger. Alternatively, you can look straight ahead into a mirror, and pinch the bottom edge of the contact lens directly off your lower iris. Be careful not to squeeze too hard. 4. Clean and store the first contact lens before removing the second. Wash with soap and running water, remembering to rinse your hands thoroughly. Dry your hands with a towel. Ensure your nails are clean and not too long. Use non-cosmetic soap as soaps with lotions or oils in them can transfer to the contact lens and cause irritation on lens application along with blurred vision. Look for nicks along the lens edges, torn lenses or visible breaks. Damaged lenses can damage the eyes, so discard the lenses and use new ones. NEVER use saliva, saline or water of any type. Tap, distilled and bottled water (and particularly saliva) contain bacteria and viruses, which may be absorbed by the contact lens and cause eye infections. Sterile saline is NOT a disinfectant nor are contact lens rewetting drops. 1. 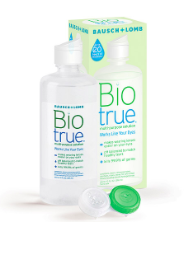 For rinsing your lenses, use Opti-free puremoist or BioTrue. 2. Place the lens bowl-side up in the palm of your hand and apply a few drops of Opti-free or BioTrue. With the pad of your finger gently rub the entire lens in a circular motion against the palm of your hand. Be sure to thoroughly clean the entire lens and then rinse it well with the same solution. 3. Use only the contact lens case provided to store your contacts. Fill the cases with Opti-Free or BioTrue liquid. Be sure to place the left and right contact lens into the correct holder. Always use fresh solution when storing your lenses. Never “top up” or use old solution. NEVER re-use old solution. 4. Do NOT allow the tip of the solution bottle to come into contact with any surface and keep the solution bottle tightly closed when not in use. Bacteria can accumulate in contact lens cases. After putting in your contact lenses, the case should always be emptied and air-dried. A new contact lens cases is included with every purchase of contact lens cleaning solution. Always throw away the old case and use the new one. The case should only be filled halfway with solution (if over-filled, the lens may ride up and be damaged by the lid). Use a smaller size bottle of solution, do NOT transfer solutions into small containers. What are the normal adaptation symptoms I can expect when wearing soft disposable contact lenses? If a lens is damaged when the patient opens the blister, then we can order a spare one for free. No warranty if they lose a contact lens. Thinking about transitioning from glasses to contact lenses? Or just want to find out if soft disposable contact lenses are right for you? Book an appointment with us today!